You are here: Home / Disney Star And Celebrity News / Night Riots Premiere “Break” Vignette With ‘BULLETT’ Magazine, Debuts At #17 On Billboard Chart! Night Riots Premiere “Break” Vignette With ‘BULLETT’ Magazine, Debuts At #17 On Billboard Chart! After climbing their way to No. 5 on SiriusXM Alt Nation’s Alt 18 Countdown with single “Contagious,” and debuting at No.17 on the Billboard Heatseekers Chart for their EP “Howl” (released Jan. 20th via Sumerian Records), Night Riots have released an eerie vignette for new song, “Break” – today on BULLETT Magazine. Watch the vignette, here: http://bit.ly/BullettBreak. With praise pouring in from the likes of Billboard, Earmilk, MTV, FUSE, Huffington Post, KROQ, All Things Go, NYLON, AV Club and Filter, and sharing recent bills with bands including Cage The Elephant, Walk The Moon, Meg Myers, OK Go, K.Flay, Step Rockets, The Mowgli’s, Wild Cub and Youngblood Hawk, NIGHT RIOTS is setting the alternative underworld ablaze as swift and smartly as their brooding, melody rich and timeless songs have already endeared them to critics. The Southern California based band has a unique melodic sensibility – delivering transcendent pop music that is both modern and timeless; as well as both sinister and romantic, with the downbeat flare of new wave, ’80s movie soundtracks. Produced by Eric Palmquist (Bad Suns, Trash Talk, Waaves, Mars), “Howl” was released on January 20th via Sumerian Records. Stream “Howl” in its entirety over on EARMILK and Spotify. Purchase the EP on iTunes here: http://bit.ly/1wGx0NT. Night Riots is Travis Hawley (Lead Vocals/Synth), Nick Fotinakes (Guitar), Matt DePauw (Guitar), Mikel Van Kranenburg (Bass) and Rico Rodriguez (Drums). 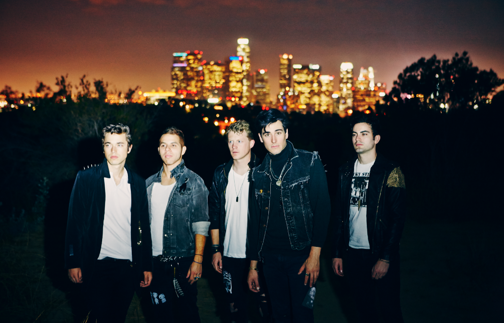 For more info, please visit: http://www.nightriots.com/. « Cody Simpson Premieres New Single “Flower” — Listen Here!